CMT Music Awards red carpet: See the best-dressed stars! 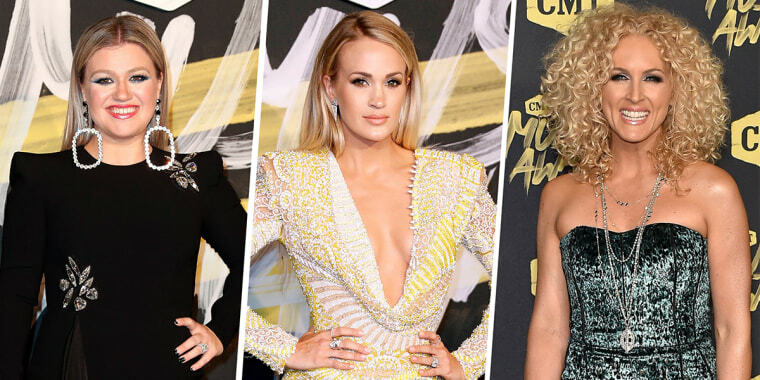 Check out all of the gorgeous looks from the red carpet at the CMT Music Awards. The amazing looks from the CMT Music Awards will have you looking for a cowboy hat! The Country Music Television awards show took place on Wednesday night in Nashville, Tennessee, and the biggest stars were all there and dressed to impress. TODAY's own Hoda Kotb headed down to enjoy the show — and even made an appearance on stage, thanks to her dear friend Blake Shelton. TODAY's Hoda Kotb showed up to rock the red carpet in leather pants and a silky blazer. So stylish! Kelly Clarkson wore a velvet black dress with an embellished waist and exaggerated shoulders. She paired it with gold statement earrings and lace-up heels. Carrie Underwood had a few gorgeous outfit changes throughout the night, but we especially loved her red carpet look. The plunging neckline and structured shoulders of the dress looked great on the singer, who took home the award for female video of the year. The Little Big Town singer rocked this jumpsuit with a sweetheart neckline in the most perfect teal hue! Don't worry, the other members of Little Big Town were there as well! Karen Fairlchild stunned in this sleek metallic dress and pumps. The "This is Us" star looked great in a sparkling black, tea-length dress with a funky fringe hem. The Sugarland singer wore this classic, handkerchief-hem dress that featured lots of sparkling embellishments. Olympian Lindsey Vonn looked red hot in this fitted gown that featured cut-outs and a short train. The singer wore wide-leg, sparkly pants that featured a fun train. She complemented the look with a matching crop top and a slicked back 'do. Not only is Cassadee Pope very on-trend, in this boxy crop top and skirt, she also paired the look with a pop of color with some adorable pink pumps. Also wagging his way down the red carpet in spectacular fashion was Instagram sensation Doug the Pug. Doug donned his best cowboy hat along with a matching harness and leash. While he wasn't invited to perform this year, he just might make the show lineup for 2019.